The 30-story atrium of the Hyatt Regency Houston, designed by JV III. From the 20th floor up, the balcony edges increase in height by one inch per level to give guests a feeling of security. Photo by Leonid Furmansky. And that was that. I didn’t think any more about Leonid or Portman that day. But, as it is with so much that might be considered fate, in a casual, unconsidered moment I had loosed an arrow that would, in short order, hit me in the derrière. Precisely a week later, on January 6, I received another text from the typically prompt Leonid. It was a photo of his camera, which was on a tripod atop a parking garage in downtown Houston, pointing at the Hyatt Regency. “Nice! Portman!” I replied. “Yes!” responded Leonid. “Let’s write an article!” Easier said than done. Again, it was a Saturday. I didn’t want to think about it. As it turned out, I didn’t have to. A week or so later I saw Michael Malone at the TxA offices. He had a pitch for me: a remembrance of John Portman. “Portman didn’t design many buildings in Texas,” he said, “but he had a huge influence on architecture here. Almost every town of significant size in the state has an atrium hotel.” Serendipity! I was sold: bespoke photographs of a nearly unknown building by a talented young photographer and an essay by one of TA’s most thoughtful and long-standing contributors. Seemed like editorial gold. There was only one problem. Portman had nothing to do with the Hyatt Regency Houston. I didn’t discover the error until the issue (March/April 2018) went out. Stephen Fox was the first to gently draw my attention to the fact that the project was actually completed by JV III — a collaborative venture between Caudill Rowlett Scott (CRS), Neuhaus & Taylor, and Koetter, Tharp & Cowell — and that CRS’ Charles “Tiny” Lawrence, father of Austin architect Mell Lawrence, had led the design. This information was reiterated in a kind email from James A. Smith, Jr. (p. 6), who worked on the project as a young designer. Both correspondents were understanding of my confusion. 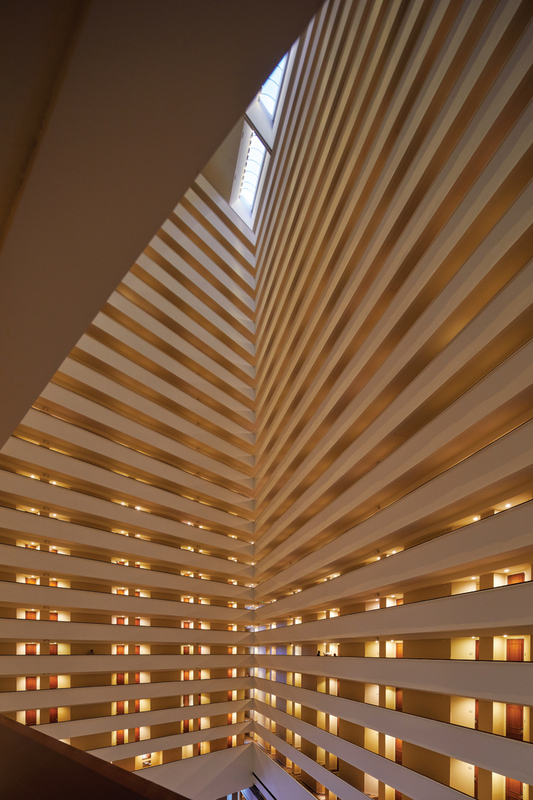 After all, the Hyatt Regency Houston bears a striking resemblance to Portman’s earlier Atlanta hotel for the same client: a yawning atrium with glass-walled elevators and a revolving restaurant perched atop the roof. According to Smith, the Pritzker family, owner of the Hyatt chain, had wanted a repeat of the Portman design without the Portman price tag or the famous architect’s prima donna antics. Upon closer comparison, the two projects clearly bear the same DNA, but the Houston hotel is visibly a more economical, client-friendly building. The atrium’s concrete interior was rendered in drywall instead of concrete, which gets grimy and is difficult to clean, and there are fewer plants, which are also a maintenance nuisance. The Houston location also features more places to buy liquor — the client’s solution to making up for all that valuable square footage lost to the 30-story, air-conditioned atrium. It is nonetheless a rigorous, exuberant space, shot through with daylight and humming with a sublime glory all its own. As for this editor, the embarrassing error is yet another reminder of the cardinal rule for gleaning any information from the internet, borrowed from an old Cold War ethos: Trust, but verify.